Fifty-six percent of voters statewide in 2014 decided to pass marijuana legalization in Oregon. That’s the greatest statewide support for legalization of the four states that have passed it. Every adult may possess an ounce of marijuana, grow four cannabis plants at home per household, possess a half-pound of marijuana at home, and shop in safe retail outlets. The only problem? If you live east of the Cascade Mountains, there will be no safe retail outlets for you. As the legislature worked on implementing the will of the majority, representatives of the people living in those eastern counties demanded a compromise. Allow the counties that really, really hate potheads to ban marijuana markets, or they’ll sue to destroy the entire state’s legal marijuana markets. Measure 91 already contained within it some powerful local control options for those counties. Any county or city could ban marijuana producers, processors, wholesalers, and retailers. But those bans would have to go before the voters in that city or county at the next election. That’s what a majority of Oregon voters decided would be fair. But the eastern counties didn’t like that idea. Their representatives argued that they had just rejected the statewide vote for legalization, so why should they have to once again muster up a majority in their county to vote against legal pot shops? 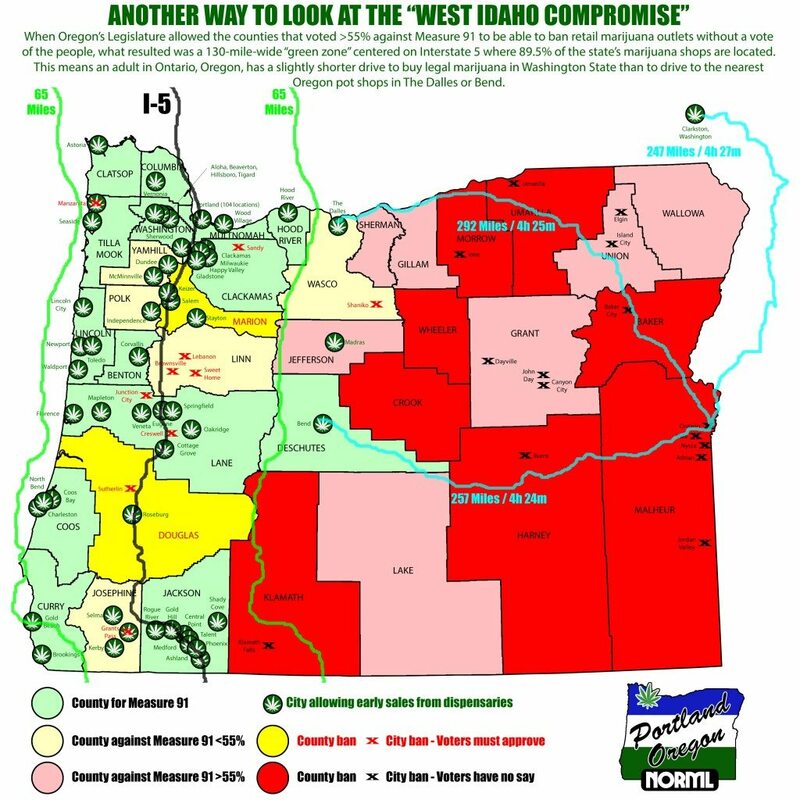 Thus, HB 3400 was passed with what I call the “West Idaho Compromise”. Those rural, conservative counties that better resemble Idaho’s culture than western Oregon’s could vote through their city councils or county commissions to ban legal marijuana markets, with no automatic referral to the ballot for voter approval, if their county voted greater than 55 percent against Measure 91. This has now led to ten counties and 25 cities to enact such bans, and only in two counties and ten cities will the voters be asked to approve those bans. It’s a critical difference. If I’m a pot-hating voter in eastern Oregon, maybe I vote no on Measure 91 because I don’t want an increase in pot’s availability. But now that it is legal statewide, as a pot-hating voter, maybe now that choice is a legal pot shop versus illegal dealers who are now legal to grow four plants and possess eight ounces. Maybe I could be persuaded that the pot shop is the lesser of those two evils. But we’ll never know, because those pot-hating counties and cities make that decision among a handful of elected representatives who are more attuned to what the downtown business owners and the rural land owners want than what the average citizen may want. Meanwhile, the legislature also passed SB 460, which allows the existing medical marijuana dispensaries to sell to all adults a limited amount of marijuana only, if the dispensary opts in. This has given us over 240 locations where adults can buy marijuana from a licensed, regulated business, rather than the dude who’s using our new legality as a cover for his weed dealing. 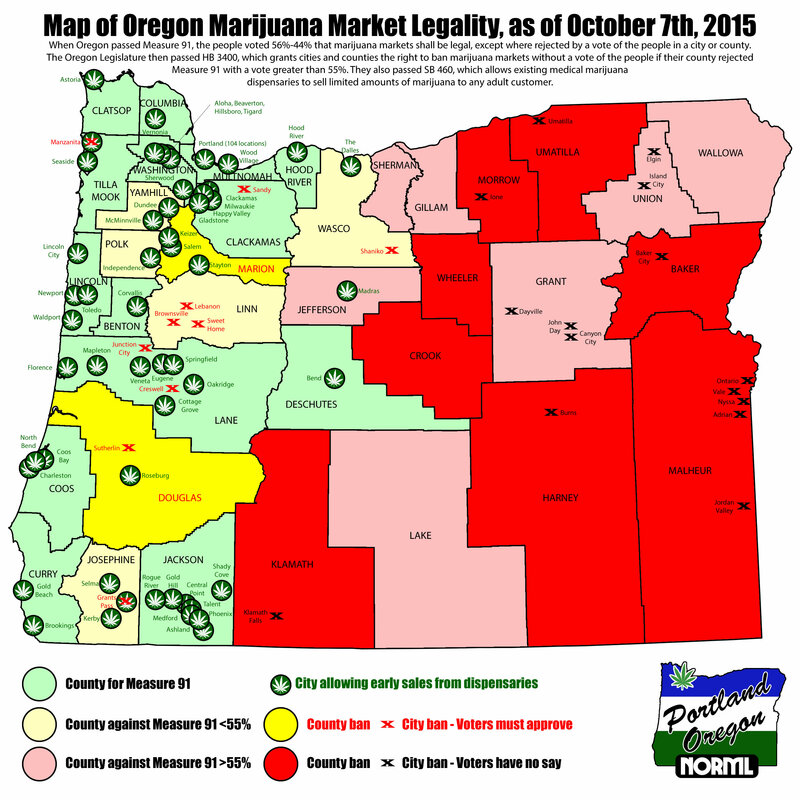 Of course, none few* of these legal marijuana outlets exist east of the Cascade Mountains. In West Idaho, prohibition still rules the commerce in marijuana. Unfortunately, starting in January, those counties will still receive a portion of the tax revenues that only western Oregon pot smokers will be paying, and they will continue to receive their unearned tax revenue until July 2017. * Thanks to commenters who noted that Wasco, Jefferson, and Deschutes counties are east of the Cascades. There are 18 retail marijuana shops in Bend (Deschutes), 3 in Madras (Jefferson), and 1 in The Dalles (Wasco). Those and the four in Brookings are the only retail marijuana shops farther than 65 miles from Interstate 5. An adult resident of Ontario, Oregon, has a shorter drive to buy legal marijuana in Washington State than to drive to the nearest pot shop in The Dalles or in Bend in his or her own state. I wouldn’t advise it, as most of that drive is through Idaho, but it makes the point that citizens in most of Oregon who voted to legalize marijuana are going to keep supporting the black market.